- Stay productive with high performance speeds: print and copy at up to 52 ppm A4. 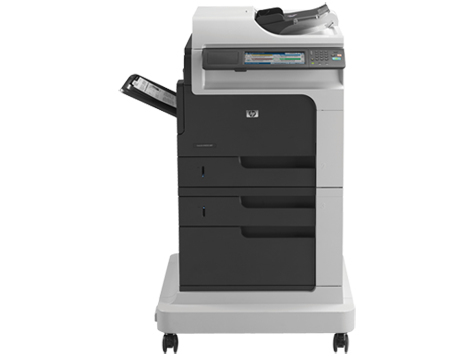 - Boost productivity – get up to 2,100-sheet paper capacity for large printing jobs from this workhorse MFP. Save time with a 3-bin, 900-sheet stapling mailbox that sorts, staples and stacks. - Preview jobs using the pivoting colour control panel and use image preview to make adjustments to scan jobs. - Save time with easy installation, and get exceptional value from optional high-capacity black print cartridges. - Save time and money by proactively managing printing environments, and get easy setup and configuration with HP management tools like industry-leading HP Web Jetadmin. - Extend the capabilities of workgroup print environments via the hardware integration pocket with a rich portfolio of easy-to-integrate solutions. - Easily update, manage and expand the capabilities of networked printers with HP FutureSmart Firmware. - Protect sensitive data stored on the HP MFP with the standard encrypted HP High-Performance Secure Hard Disk. - Process jobs securely: require a PIN to retrieve print jobs, expand IP addresses on your network with IPv6 and implement network access control with IPSec. - Create, print, scan and share sensitive business information securely via encrypted email and PDFs. - Add optional authentication security solutions through the hardware integration pocket. - Reduce energy use with Instant-on Technology and Instant-on Copy. - Conserve resources and save paper –automatic two-sided printing reduces paper consumption and PIN printing ensures only authorised use of the MFP. - Original HP LaserJet print cartridges with energy-efficient toner enable an energy saving of over 18% on every page you print. - Get free, easy cartridge recycling with HP Planet Partners, plus reduce shipping materials with HP ClearView packaging. - Reduce paper use by up to 50% using automatic two-sided printing. - Reduce clutter and waste – scan, store and share documents digitally.